Baal HaSualm, Shamati, article 9, “What are Three Things that Broaden a Man’s Mind in the Work.” The Holy Zohar interprets what our sages had written: “Three things broaden one’s mind. These are, a handsome woman, a handsome abode, and handsome Kelim (Vessels).” It says, “A handsome woman, this is the Holy Shechina (Divinity). A handsome abode, this is one’s heart; and handsome Kelim, these are one’s organs. We must explain that the Holy Shechina cannot appear in its true form, which is a state of grace and beauty, except when one has handsome Kelim, which are the organs, elicited from the heart. This is about our vessels, which are desires that must be transformed since we currently don’t use them correctly; we use them for our own benefit. A “woman” that is handsome to the desire to receive is ugly for the desire to bestow and must be transformed not to be graceful or beautiful, but modest, which means that she is totally in Hassadim. A “handsome abode” is the whole human heart and “handsome vessels” are the external desires. This is how the five levels of our vessels are termed. The vessels are corrected by envy, lust, and honor, the attributes that take a person out of the egoistic world by evoking him to rise to new values. Today, it is not in our power to perceive and to identify any aspect of spiritual life. We cannot attain such values, discernments, levels of attainment, feelings, and understandings. However, we can “expand our mind,” which means to start bringing the attributes of bestowal into the desire to receive. How can we fulfill this? The point is that bestowal is essentially an intention and not a desire. Therefore, it is possible if I first stop working with the desire to receive and restrict it. As of today, it isn’t the place in which I receive pleasure or sufferings. I “close” it, and this attribute isn’t in me anymore. Then, I develop the option to receive something on the side: “I will use you now as I see fit.” When different pleasures come along that I previously used to receive in this desire, I reject them now one by one, from the smallest pleasure to the biggest one. What do I need this for? Is it because I am simply “on a diet?” No, I reject the pleasures because I want to resemble the Creator. This means that I must recognize the importance of the Creator and not receive anything. I receive this recognition of importance from the group, and I begin to value the Creator, the attribute of bestowal. Then, I really don’t use my desire to receive. Let the pleasures come, above my desire. I want to develop and to build the desire to bestow above it. Thus, I already stabilize the human image inside me, the image of Adam that resembles (Domeh) the Creator. I use my desire to receive, the pleasure, the group, and the force of the Light that comes and fulfills all this as means to bestow upon Him. Bestowal upon the Creator is the means that allows us to bring Him contentment. Is that the goal? No, that is also a means. The goal is to attain adhesion with Him since it is that which He really enjoys. This turns into the means to attain a higher goal along our way, and it is so until we reach the end. Question: At what point does a personal relationship with the Creator appear in the created being? Answer: It already was awoken in Ein Sof (Infinity), in the four phases of the Direct Light. Otherwise, phase one (Hochma) wouldn’t have given birth to phase two (Bina). Question: Is that the point in the heart? Answer: No, it is a result of those stages. The point that awakens in a person’s heart is a spark of the general Returning Light that was in the soul of Adam HaRishon (first man) at the time of the shattering. Question: So, when does a person begin to feel the Creator’s attitude? Because then everything becomes clear. Answer: Everything would be understood by the ego, and we shouldn’t let this happen. If I show you that I feel absolute, endless, unconditional love toward you, then you will begin to disrespect me and even hate me. Because you are a desire to receive, and, when there are no limits to this desire, when fear doesn’t limit it, it “goes wild.” Eventually, you would begin to treat me badly. It really is so. So, instead of love on my part, you would see what seems like a bad attitude and unpleasantness. Question: However, still, we have a point in the heart with which we have to start the process, but we get stuck since we have no basis. Answer: There was a general vessel of Adam HaRishon and it had a Returning Light. Adam HaRishon wanted to receive all the great Light in order to bestow, but couldn’t keep it in the Returning Light, and everything was shattered. There are only Reshimot (spiritual genes) left from the desire and Reshimot from the Masach (screen), and they are the ones that awaken and are called “a point in the heart” (•). This point doesn’t come from the Creator; it is part or a spark of the Masach. In spirituality, there is no difference between the state and its Reshimot, which is also a full picture of reality that is not yet clear to a person. So, we must draw the Light that Reforms (the Surrounding Light) to the Reshimot, and then we will see the picture of the spiritual world. It is a very simple action. You are in a group and study from the sources, for example, from The Book of Zohar, and by that, you summon the Light upon yourself and it operates. Question: Is there something concrete or visual for me in this work? Can I feel how our “points in the heart” are attracted to one another and how the Light unites them? Answer: If you nullify your ego and the friend seems more important to you than yourself, if the group provides you with such importance that you want to jump inside it and disappear without hesitation, to be swallowed in it, if you exert yourself in that and make efforts “by the sweat of your brow,” then to the same extent, you summon the Light that operates on you and bestows upon you from the Reshimot and builds the spiritual level. Question: Will we become one whole so that everyone will feel it? Answer: Of course, whoever participates in this process, whoever does this, feels it. As it is written, “Make yourself a Rav and buy yourself a friend.” It refers to the types of connections that we can reach between us and between us and the Creator. Our correction from the shattering depends on this connection. To the extent that we connect and leap over the shattering and correct it, then, in the corrected vessels, in the connection between them, we discover the spiritual reality. However, we constantly can renew the spiritual Reshimot by correcting the connection between us each time. If a person understands that he can fulfill these spiritual Reshimot, can clarify and correct them, then, in the corrected Reshimot, he feels his next level of existence, which means the spiritual life. Corporeal life is fulfilled by one Reshimo on the animate level, and, when it is completely fulfilled—which means that it goes through the phases of Ibur (gestation), Yenika (suckling), and Mochin (mind)—a person dies. However, on the level of “speaking,” we can fulfill many Reshimot by constantly changing them; we can feel our advancement in them toward the attainment of the spiritual world. In contrast to the corporeal world that is felt in the corporeal Reshimo, the spiritual world is felt in the corrected spiritual Reshimot, which means in the connection between us. 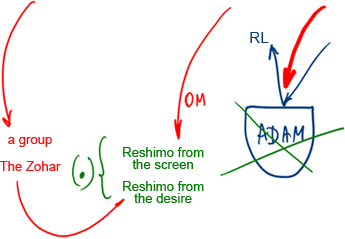 It turns out that we are living in two worlds simultaneously: in the corporeal Reshimo, in feeling our body, and in the corrupt spiritual Reshimot by feeling the corrupt connection between us. If we correct this connection, then, in the corrected Reshimot, we discover the spiritual level; instead of a shattered world, we feel the corrected world. Accordingly, we feel the new corrected desires and, in them, the Light that fills them according to their level of correction. Question: Due to recent changes (from the women’s convention), a big importance of women’s unity has emerged. There are women who are more active and less active in our group. For the active women, we organize certain activities and separate workshops, thereby creating a few circles in the women’s community. As a result, there are many unhappy women who think that we have split this community. Is it right to do this in the women’s group? Answer: I believe it is incorrect. The mass should be as uniform as possible. I do not divide anyone. Some women participate less, no matter for what reason, some more. I never look for reasons, especially if we are talking about women, not men. Men can be pressed, but women should not be, and in general, women should be treated as equal to men. But they must not make any divisions between themselves. Absolutely no! Question: So, on what principle could the women’s group be formed? Answer: According to the principle of the circle—everyone is equal. If I want to advance towards spirituality, I do not need earthly levels: What honors I would be rewarded, how many stars they attach to me? What is important for me is spiritual ascent, and I do not ask anything for myself. If it is possible to invest my efforts, I invest them, if there is no opportunity, then there is none. But a person should wait for the highest reward for his invested efforts, rather than have power and position in the group. What for? This is incorrect! There are people who have organizational skills; it is another matter. We appoint them to be responsible for this or that because we benefit if they are engaged in these duties or something else, but in any case, we should not divide the group. We have people who work very hard for the group. So what? Are they supposed to get more? For what reason? As for women, they are mostly not free; they have a husband, family, children, and parents. So, we cannot demand the same things from them as from men. Question: During the workshops and lessons at the Arava convention was the first time I was awarded with strong hatred for the group. It is difficult to overcome. How can I work with this; is it through work in the intervals between the congresses or work during the congresses? In other words, when we face this at a convention, do we overcome this by means of our work in between the congresses and there must be a constant effort to control oneself? Answer: The effort should be in place. You need to prepare for falls in advance. There is nothing wrong with them. On the contrary, you need to meet these states with joy, despite the fact that you feel, “How can it be? I don’t want that!” This inner struggle is very good and essential. In any case, do not try to remove it, do not erase it, but also do not dwell on it inside, do not beat yourself up, but rise above it correctly. It should be understood, in spite of feeling hatred, that the Creator sent it so that I recognize my egoism, how much more it is revealed in me now, and that is why, instead of love and agreement with the group, I feel hatred; I must rise above it and ask the Creator to help me. Don’t try to rise and get out of the pit you fell into by yourself, but ask the Creator to help you get out of it together with Him. Then you will have some contact with Him. This is why He arranged this fall for you. We need to prepare for falls. Our workshops are especially good preparation for them. My Comment: Society is not obliged to provide everyone with work, but it must take care of providing basic necessities for everyone. It also should take care of integral education for all the citizens in order to bring society to equilibrium with Nature. Spain’s Lost Generation? No, A Newfound One! In the News (from Business Inquirer): “The world’s political and business elite gathered in the snow-covered resort of Davos on Wednesday, aiming to instil some confidence in the global economy amid tentative signs of recovery. My Comment: As long as politicians and economists are not aware of the dead end in egoistic protectionist development, do not recognize that the future of the world lies in global integral development, sustainable production and consumption, avoiding excessive production, and accept the need for equal rational consumption by all the people in the world, up to the point of full integration of all of humanity as the next stage of our development, the crisis will inevitably force us to recognize our mistakes through its dramatic manifestations. Looking at the creation as a whole, in every object, in every part of it, we can recognize a measure of desire: desire to preserve itself, its properties, its state. This pertains to any part of inanimate, vegetative, animal, and human nature. Each one is characterized by a particular degree of desire since desire was the only thing that was created. On our part, we just add to it when we have a chance to work above it. At the still, vegetative, and animal levels, we live within desire and don’t understand how it can be changed in height, size, and application. On the other hand, a human degree in a person acquires a capacity to comprehend this, start wanting to change, and apply the desire in a different manner, and this ability to modify the application and realization of desire doesn’t let us rest. We see how people live today: society dictates the size and nature of their desire, and they, like soldiers, strive to carry out the orders they receive. After all, they are given an impression that it’s for their own good. However, those who receive an additional need to work above their nature, above their desire, which is, in fact, nature’s entire material, are deprived of rest. They wish to learn, desire to know how matter, nature, can be employed, how to re-direct and “deploy” oneself so as to achieve something above nature. This is a totally different approach: not to be inside nature, but namely above it. This is what the science of Kabbalah teaches: to use desire living not in it, but above it in order to keep attaining the upper reality. “Upper” means above desire, above the creation’s matter. We must learn how to govern desire to remain above it without sinking to the bottom, but, rather, going with the waves and using the breath of the wind, the “spirit” breathing over the sea. We need to live by something that lies above these “depths,” to breathe air, inflate sails with the wind and use the water solely to glide over its surface. That’s what we gradually learn in this study. We learn to use our nature, the matter of desire, to control it from outside of ourselves, to restrict and turn it in the required direction, to verify and modify it, not as our nature dictates, but as we choose. This ability we can obtain with the help of the science of Kabbalah by studying the systems we have to know and as a whole, the system of the worlds, 125 steps of changes, calibration of desire. We figure out how to use it each step of the way in order to achieve something above it. In addition, above it, we reach the degree of the upper force that created this desire in which all of mankind lives. We use the matter of desire solely to “ascend” over it and form for ourselves a spirit, equivalent to the upper force. This is the spiritual equivalent called “Human” (Adam). Thereby, we use the matter itself and the force that created it; we construct ourselves from both. This is how a person becomes independent from matter, meaning desire, and from the force, meaning the Creator who created this desire, and gets on his feet on his own. Now, he is comprised of matter and spirit, but in the form he has found by himself and has chosen freely. This is what our goal is, and we won’t rest until we reach it. That’s how we are made. Some will select this path by necessity, as simple workers. However, they will have to comprehend their task, although not at high degrees, not at the level of the root cause of creation. They will follow us, whereas we won’t be at peace until we attain the equivalence that we are to create on our own, the image of Man, free from both the creation as well as the Creator. From Him, we only learn how to build ourselves in His likeness, but the Creator does not obligate us to it. On the contrary, it is the independent evolution that allows us to realize that His form is the most correct one, the best, most desirable, and profound. Yet, we do not accept the importance of this form automatically, but rather, work by way of “faith above reason,” become unplugged from the conditions of our material and the upper force, and in this disconnection from everything, attain the value of the property of bestowal which is the highest there is. These things will unfold in us later on, but for now they already should be giving us a some sense of importance and understanding of the work that requires us to rise constantly above the mundane. We seek pleasure in part from knowledge, habits, and all types of values that have been planted in us. We strive to ascend just as high as possible and enjoy changes, even if it is not very pleasant for our matter. We simply need to get used to it. Spirituality, or the new form, by way of small actions, time after time, pulls us higher and higher, a little more and then more. And spirituality should be something that we desire. Question: If positive and correct surroundings ever emerge in Israel, what will it look like? Answer: I spoke about specifics in Israel yesterday in Ashdod at the lecture that was dedicated to “What Awaits Us in 2013.” All we can expect is the result of our own work. Whatever we accomplish, we’ll get back accordingly. We are the masters of our destiny and all depends on what we choose. If we know how this world is organized and governed and have some idea on what the upper force is, the way It acts and where It leads us, if we follow it and become Its partners, we will easily and quickly reach success. In this case, everybody will follow us and we will be blessed both in this world and in the upper world. If we don’t do that, we will have to go through very harsh adversities, mostly in the fields of safety, healthcare, unemployment, anti-Semitism, etc. We will be subject to very strong pressure that will obligate us to do our job anyway and give the method of correction to the entire world. The world has always hated Jews without any clear understanding of the reason for this animosity and they blame the Jews for all their troubles. Today, we have to explain to others why they hate us so much. Actually, unless we fulfill our mission, there is reason to hate us. However, hatred by itself won’t help. Other nations should be assisting us in the mass distribution of the wisdom of Kabbalah masses; it will bring all of us to correction. The time has come; there is no point in waiting for something particular to happen. Whatever comes about will be an outcome of our desires. This is what I talked about at the lecture. We have to move in this direction, and Israel will become the center of the worldwide education where the Light will spread to all. This means that there will be a large integrated education academy. It will be based on a strong and solid ideological platform; thousands of people will learn how to act together in connection with each other. For without connection, there is no force. They will be similar to the Sanhedrin, and unity will let people develop new and innovative methods of educating children, adults, and various sectors of society and will provide answers to their questions. So the method of correction will spread from here all over the world, and our regional groups will become major educational branches that will adapt and translate the study materials to suit their countries and regions. They will hold workshops, lectures, discussions, and broadcasts in the media so that the methodology will quickly spread everywhere and the world will see it as the only way to achieve a good and comfortable future and satisfaction. And then, thanks to integral education, people will see that there is another “dimension” behind it. People will see that unity offers them the possibility of a special uplifting, and they will aspire to it. This is the way they will attain the Creator. It is said: “All shall know Me from the least unto the greatest.” The wisdom and general desire to unite with the upper force and nature, to achieve harmony, universal integral relationships, internal connection, and worldwide community based on the principles of mutual guarantee will spread throughout the world.